PARADISE! That's the first thing that entered our minds when we came to Galiano Island. Close to major cities, but yet you feel a million miles away. Many unspoiled, natural and wild beaches, friendly people and west coast wilderness all around. Our house is nestled in a fir and arbutus forest, with lots of sunlight, fantastic ocean, mountain and sunset views, and a very cozy and comfortable house to relax in. There is not a single house to be seen from our Galiano Getaway Cottage so you can find the peace and quiet you have been looking for. Children are welcome in our house as our house is child friendly. There's lots to do on the island; swim, bike, explore or shop... or you can relax on the deck and read your book!! If you are trying to get away from the 'Madding Crowd', give our house on Galiano Island a visit!! Jim and I fell in love with Galiano in 1988 and were fortunate to be able to buy our house there. We have spent a lot of time fixing it up for ourselves and for others to use. We have had so many wonderful times on Galiano Island. We exchanged our wedding vows with our family and friends around us in Bluff Park overlooking Active Pass, on Galiano in 1989. Since then we have spent time every summer with our two daughters exploring the island and spending time together. When we escape to Galiano from Vancouver for a few days, we always feel rejuvenated and energized when we return to our busy city lives. In the spring and fall we try to get over to the island with our friends- long weekends with other families, Jim with his poker friends and Amanda with her women friends. The house is fabulous for just getting away and being together. Our favorite things to do on the island are walking in to Pebble Beach, jumping off the dock at the government dock at the north end, walking around the trail at Montague Park, going for ice cream at the marina and scoops, shopping at Ixchel craft shop, watching movies Saturday afternoon at the Gulf Islands film school, swimming at Morning beach or Cable Bay, playing monopoly and reading books out on our deck and best of all, having a relaxing dinner out on our deck as the sun goes down. Our house is a 10 minute walk down to the ocean where there is public access to the shoreline. All new electric heaters thought the house heat the house. New airtight wood stove for those who enjoy the coziness of wood heat as well. Sugar, spices, salt & pepper supplied. Lots to read while you are here. New bluetooth sound system to hook up to your smart phone. Big and cozy with excellent view. Galiano Golf Course - wonderful 9 hoke course. This was such a magical setting in the forest! 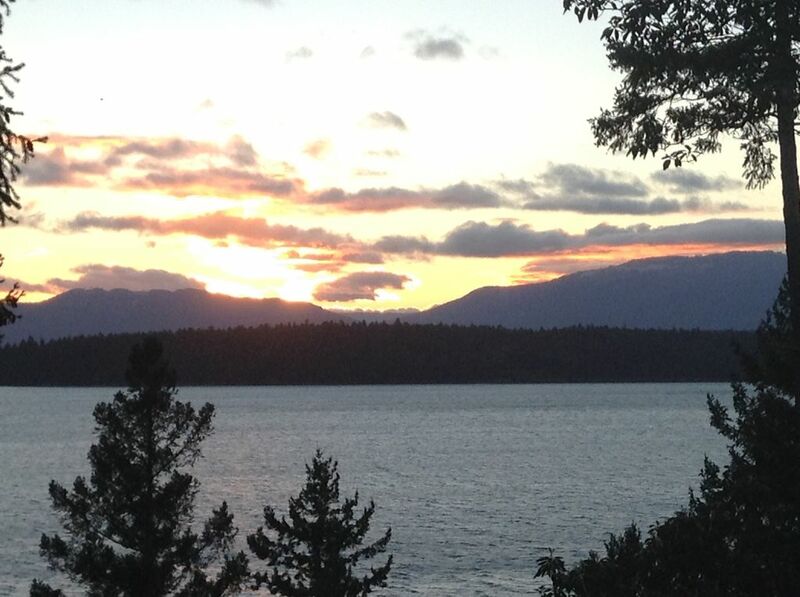 We would love to return to the Galiano Getaway. Everything was perfect, and Amanda was a wonderful and helpful host. The view from the deck and bedrooms is amazing. We loved the privacy of being in the forest. What a wonderful place! great view, quiet, but some disappointments. I loved the view,the quiet atmosphere, but the cabin itself for the price was disappointing. Positives: view,quiet area,beautiful trees,nice deck. Negatives: electrical needs upgrade, was shocked when i plugged in my hair dryer. no lights turned on in second bedroom. Was not informed the water was not drinkable, steep rocky area, not suited to small children. smell of animal feces in basement. bathtub shorter than average, had a nice relaxing time, but price not reflective of quality of house. I always appreciate reviews as it keeps us on our toes! I did respond directly to Bev when she posted this and will add a few notes now. Note to all.... whenever you are staying in someone's vacation rental, owners appreciate feedback when you are IN the house if you can contact them. Most owners will work hard to rectify most problems immediately! We did get an electrician to the house to do some upgrades in September and have put up some directions to assist in operating the lighting system! We do have a new bathtub that had to be specially ordered to fit in the smaller space available when we upgraded our bathroom last year but it is very clean and very comfy. As far as the basement foul smell we have investigated that fully and have rectified the problem. Mice do like island homes so we are very attentive to their visitations! Our drinking water has always passed water quality tests but have offered bottled water for renters who might be concerned. We have now added a very cool UV/LED water purifier at our kitchen sink to insure safe water at all times. This is the 30th year we have shared our Galiano Getaway with others. It is a lot of work to keep a vacation rental in the Gulf Islands and I so appreciate that people enjoy staying at our cabin as much as we do! Our family group really enjoyed Galiano from this absolutely comfortable and thoughtfully appointed home. A very quiet and relaxing getaway indeed! As previous reviewers have said, don't hesitate to book. Thank you for having our team to stay at your lovely home. We didn't spend long there but it was the perfect spot for us to rest and relax between shifts. Would love to go back to stay and enjoy for a longer length of time! Thank you so much Emma! I am sure the wedding at Bodega Ridge was awesome! Come back for a peaceful getaway soon. Galiano getaway is just that! We just got back from 4 blissful days at Amanda’s beautiful getaway! Everything you need is there, cabin is well equipped and very clean. We like the true rustic cabin feel of it, giving us instant relaxation. Beautiful ocean views from the awesome deck. It was a bonus that it is so kid and dog friendly! Amanda was very helpful giving suggestions on things to do on the island, but we were always happy to return to the cabin and relax. Thanks again Amanda, we didn’t want to leave, and will be back! it all! We look forward to your return! Just as described was very Peaceful and an amazing view. We had a great time at Galiano Getaway so did our pup. I loved the deck where he could roam in and out. Fall, Winter & Spring - 3 night minimum on long weekends. $200./nt. Wedding party guests - 4 adults max. $200./nt Inquire about extended stays from October to May. July & August weekly Saturday to Saturday rentals only. Email me with rate inquiries. Weekends in June & September - $200./nt. MORE THAN 5 ADULTS - ONLY at owner's approval & possible additional fees may be applicable.